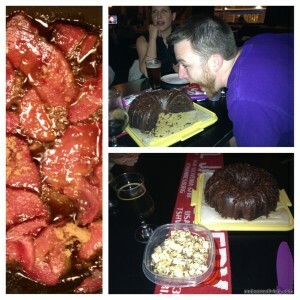 The quest: to bake a cake with Midweek Beer Geek’s Featured beer: Odell’s Lugene Chocolate Milk Stout. The mission: to find the best recipe I could (I’m not that crafty or scientific for my own recipe!). 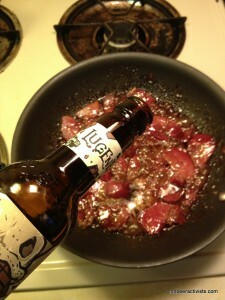 It had to be easy, delicious, and would pair smoothly with the Lugene. 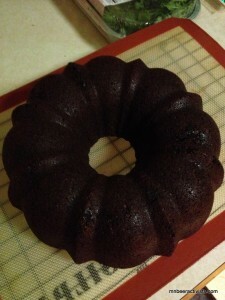 The journey: I settled on a bundt cake. I had so many ideas. 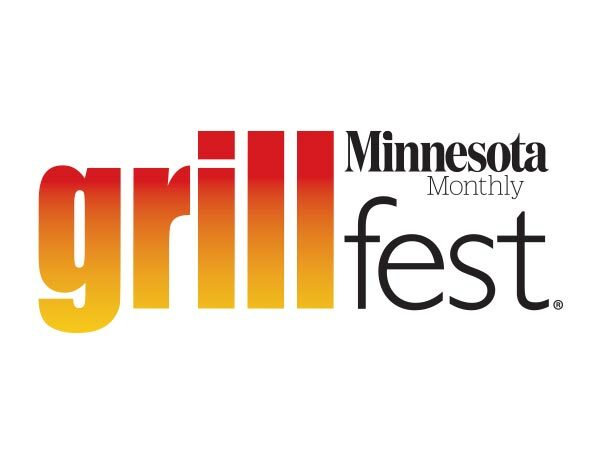 I researched a TON of great recipes, but this one seemed fitting & would feed a thirsty crowd. 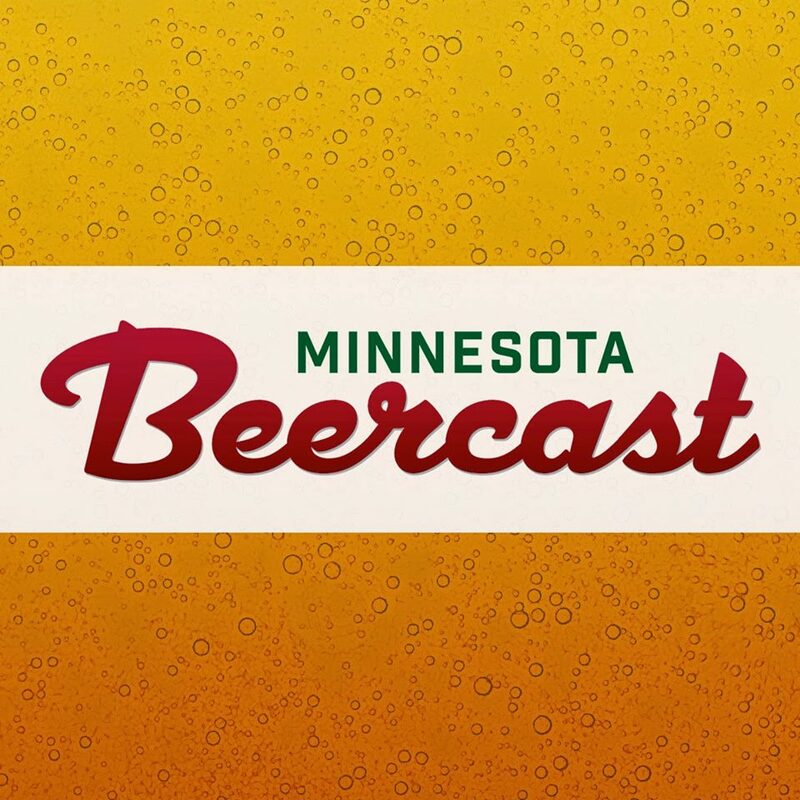 Follow me to chocolate-bacon-stout bliss!! First I cooked the candied bacon in a medium skillet. Cook the bacon til it’s cooked through. Drain off excess grease. Add the liquors & sugars to the pan. Cook bacon until bubbly & liquid cooks down. Set aside on a nonstick surface to cool. Do not clean pan- use for next steps! Spray/grease bundt pan. Turn oven on to 350. 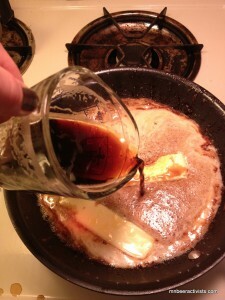 Add 1 cup stout & 1 cup unsalted butter ( 2 sticks!) to bacon pan. Cook over medium heat until melted. Add cocoa powder and whisk until smooth. **as mixture sits it will separate. Just stir before adding to egg mixture. Cool slightly. Making butter & stout mixture. Whisk flour,sugar,baking soda & salt in a large bowl & blend. Set aside. Using an electric mixer, beat eggs & sour cream in a large bowl. Add chocolate stout mixture to eggs & beat just to combine. Add flour mixture & beat briefly on slow speed. With a spatula fold batter until well combined. Bake at 350 for 40-45 mins. Check with toothpicks til picks come out clean. Set aside til cool. Flip upside down onto serving plate. In a small sauce pan, add heavy cream & sugar. Combine until sugar is dissolved & almost to a boil. Pour over chips in a medium bowl. Stir until smooth. Pour over cooled cake. Finely chop up candied bacon. 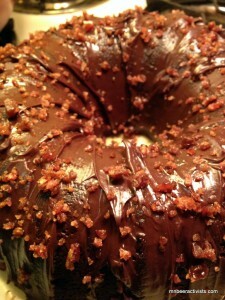 Sprinkle onto moist ganache. Let ganache cool & setup. Serve & enjoy!! Bacon! And enjoying at Midweek Beer Geek! Plus Chocolate Cheese! **Trimming bacon or using a lean bacon (cottage style) will make cook time a lot easier & tastier! **Want more bacon?? Add bacon into the cake- pour half the batter into pan, sprinkle bacon & them pour rest of batter. Bake as directed.